DT Post by Gwen - Star quilt pattern! 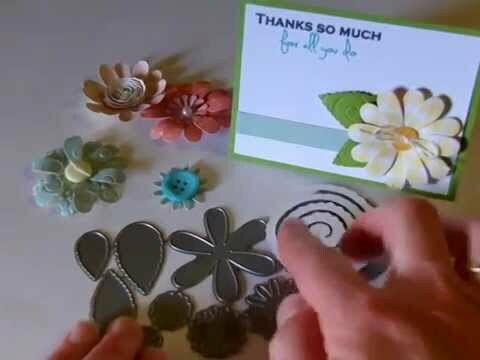 Hi everyone, this is Gwen from This and That by Gwen sharing a fun card. I love the colors of this card, they are so warm and inviting. This is the LeMoyne Star quilt pattern. The star was cut from the Art Philosophy cartridge and then cut apart to make the diamond shapes. Every other diamond shape is popped up. The tag was made with the Ribbon Banners - Straight metal dies (I just cut the end off of it) and stamped with the new Fall Leaves stamp set, both from My Craft Spot. 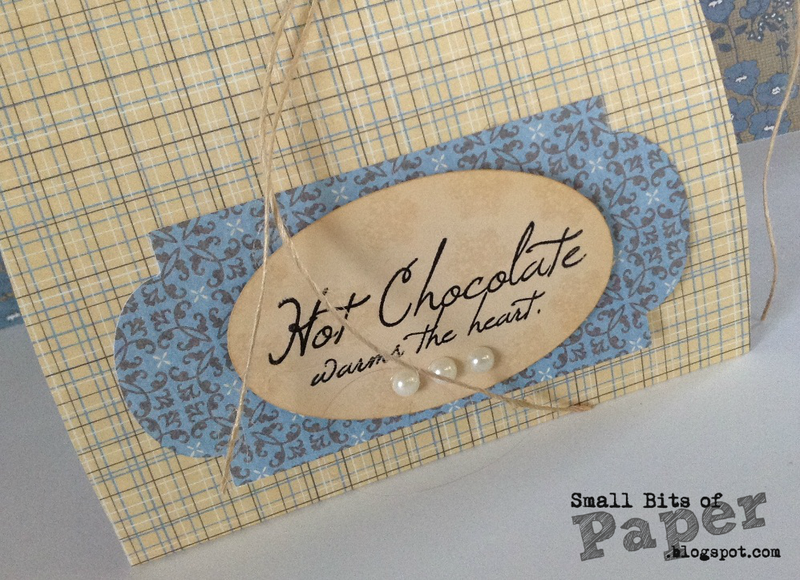 Saundra made this cute treat box filled with chocolate! 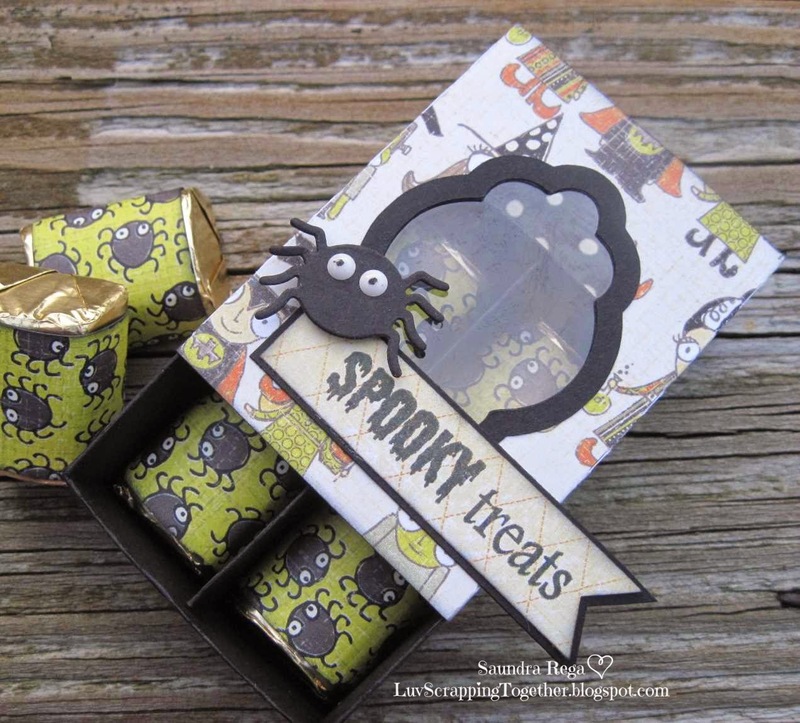 I love the pretty window on her treat box and her sentiment and spider are soooo cute! Here are some more fun 'Sweet Treats' you may remember - a blast from the past! 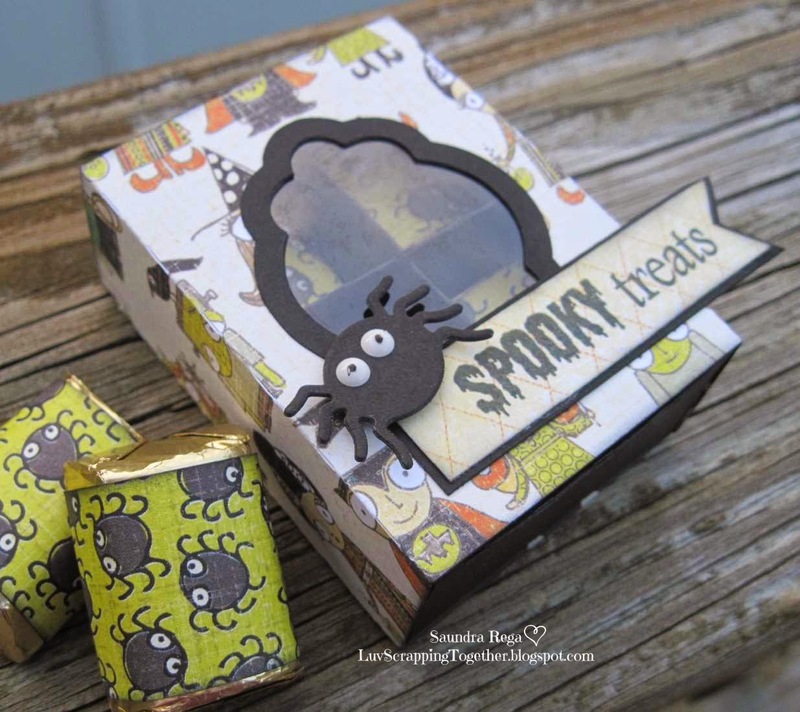 These spooky stamps are from the Ornate Labels - Halloween stamp set and metal dies. Perfect packaging for a piece of pumpkin pie! Gigi made these awesome treat boxes! 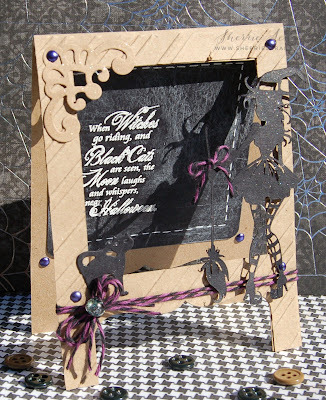 The sentiments and frame stamps are from the Ornate Labels - Halloween stamp set and metal dies. I love to make sweet breads to give away to friends and neighbors. My leaf tag was stamped with a sentiment from the Happy Fall stamp set. 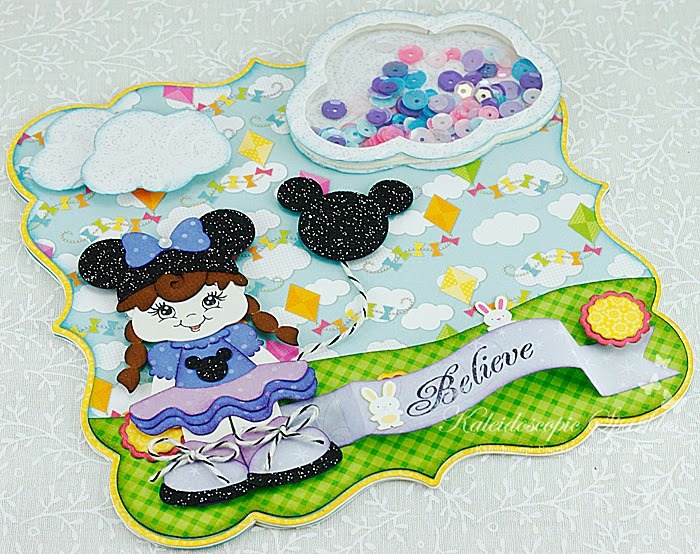 Click HERE to see all of the fun stamps, metal dies, sequins, bakers twine and ribbon at My Craft Spot! Customer Spotlight - Beth from Beth's Beauties! 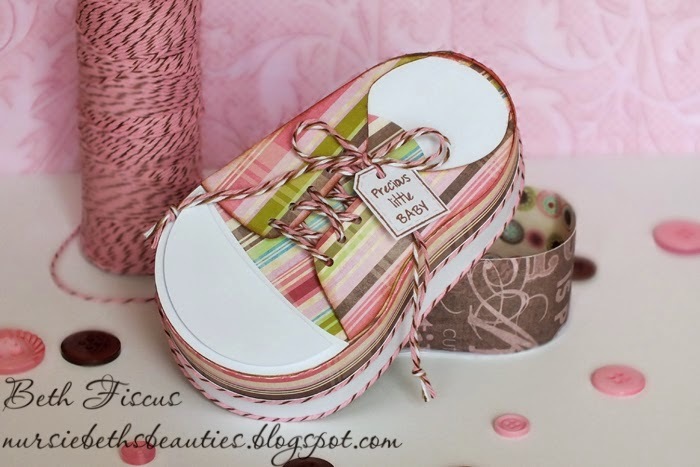 Beth created this darling sneaker gift box, which filled my sappy heart with joy. Tiny baby socks would be so fun inside, too! We love seeing Kimberly's lovely products in action! Thank you for inspiring us, Beth! :o) Have a blessed day, everyone! 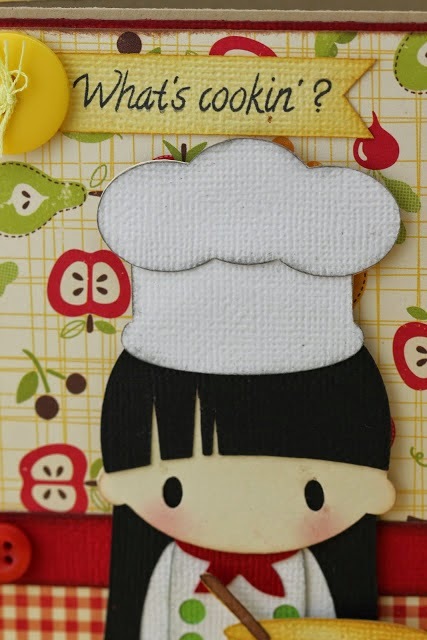 DT Post by Karen - Fun shaker card! ...and I want Lily to find joy amidst her dark and cloudy days. So I tucked them within a puffy cloud, which is embossed for texture and lightly inked in blue. Along with loving purple, she loves Disney. 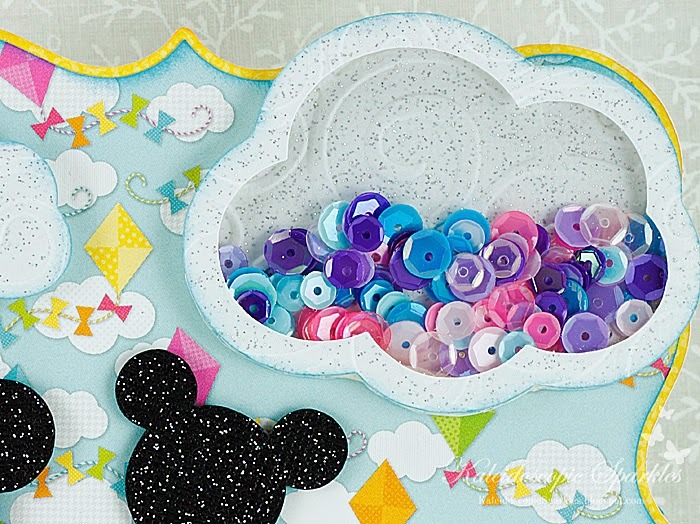 The darling Disney sweetheart is a cut file from Treasure Box Designs (We're All Ears). I dressed her in Lily's favorite color and used Black Licorice Traditional twine for the shoelaces and Mickey balloon string. Sometimes the simplest sentiments say it all, don't they? :o) Believe is from the Ornate Labels- Christmas stamp set. 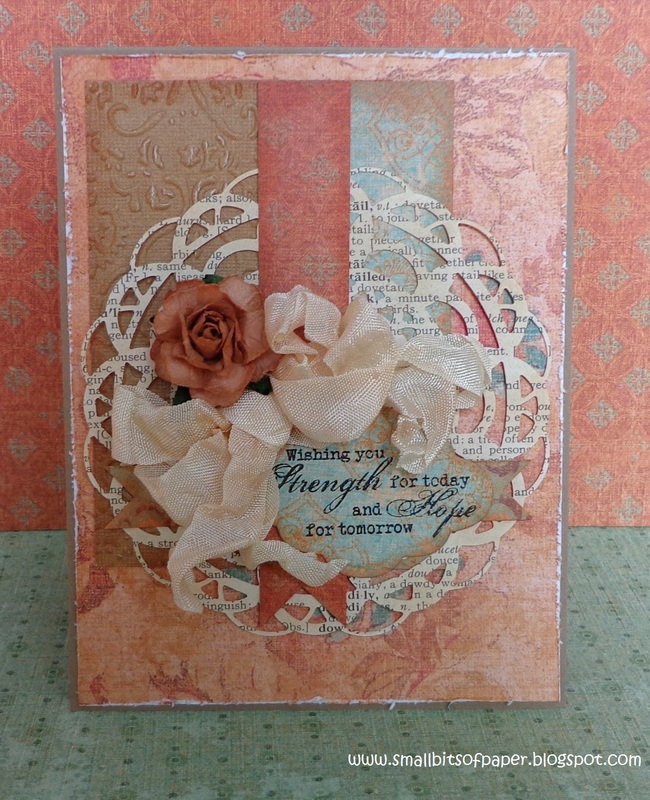 I used the Ribbon Banners- Wavy metal die set as its base for an extra touch of whimsy and height. The little flowers in the grass were made with the Flowers- Daisy metal die set. 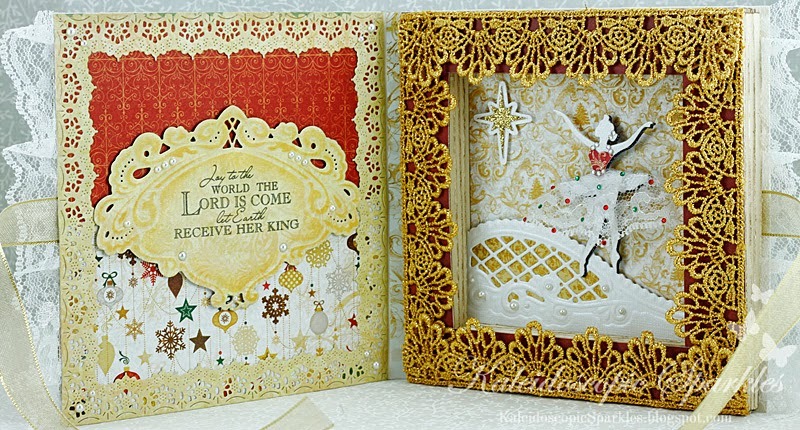 For further details about my card, zip on over to my blog. :o) Thank you for visiting My Craft Spot and I wish you a beautiful day! Winners from Challenge #151 - Chalk Art! Your 'chalky' projects were all amazing! Thanks for joining the fun!! Lisa used the Clock Time stamp set on her fun tag. The fun sentiment is part hand written and the 'dog-gone' stamp is from the Cute Critters stamp set. 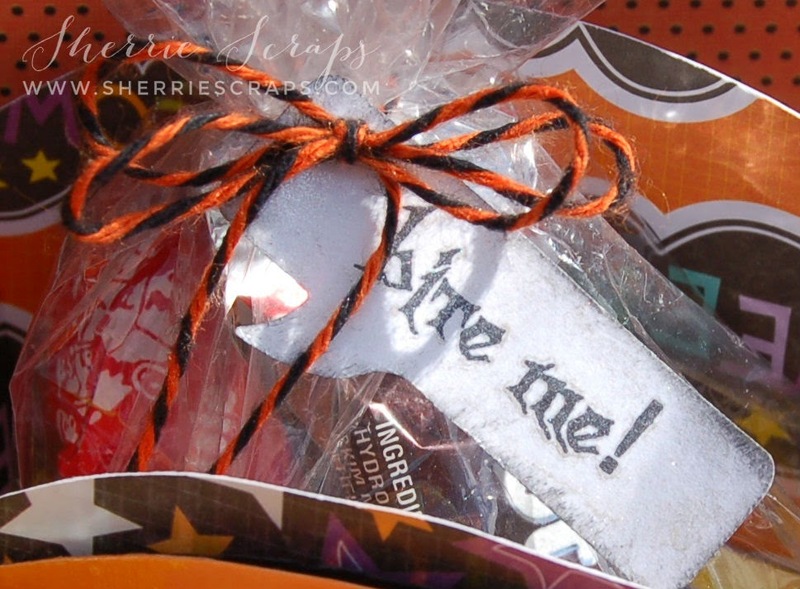 Sherrie's pretty sentiment is from the Spooky Treats stamp set. Visit My Craft Spot online store. 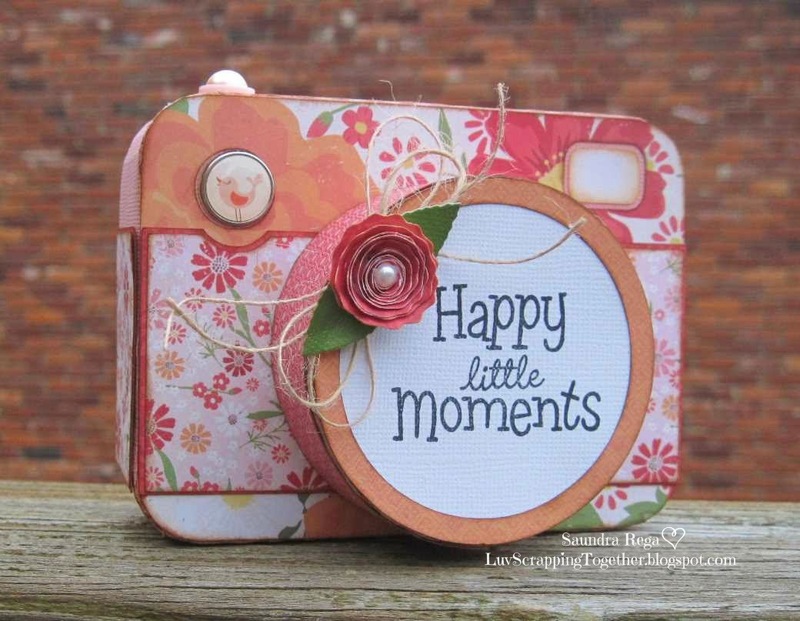 DT Post by Saundra - Happy little moments! Hi There! Saundra here from Luv Scrapping Together! Today I have a fun little camera box to share with you. 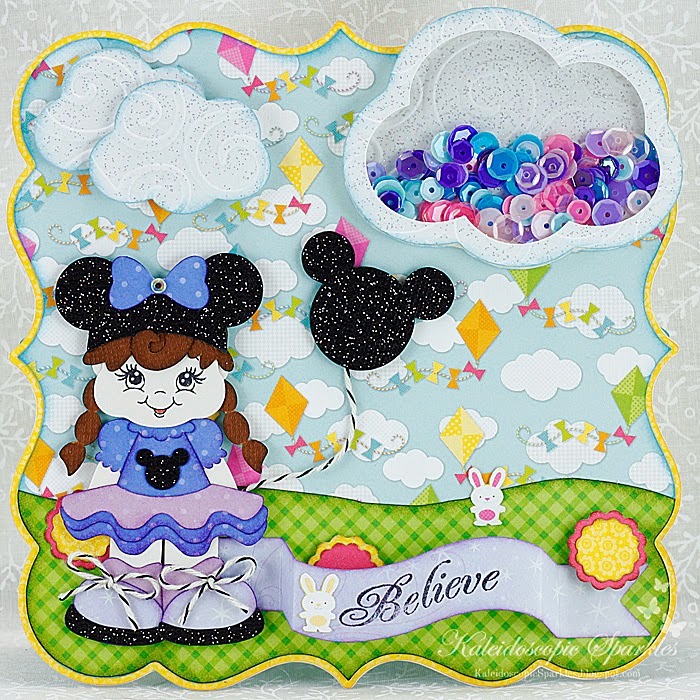 I made this fun box using a the Camera Trio file from My Scrap Chick and used My Craft Spot products to give it just the right touch. 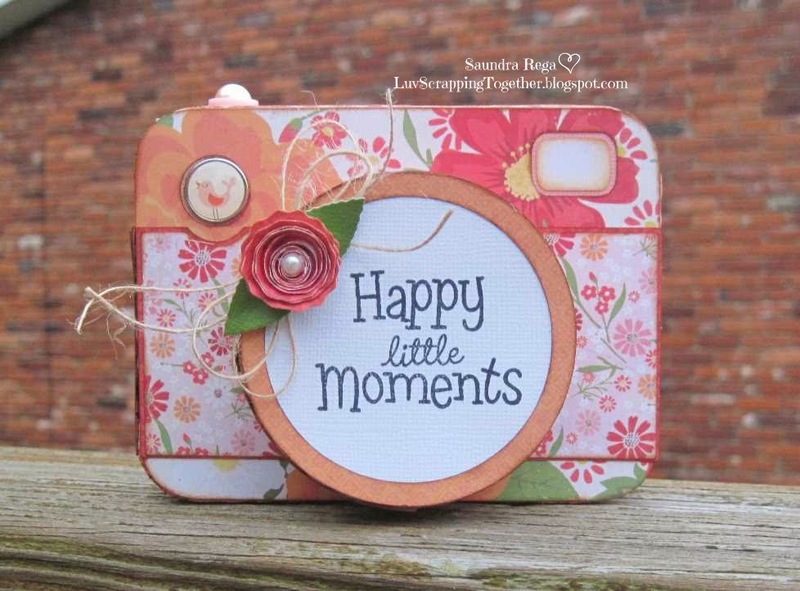 The front of my camera is stamped with a sentiment from the Scrapping Life Everyday stamp set and embellished the camera with a rolled flower and leaves from Flowers - Daisy dies. Some Natural Jute Twine was added, as well as, a few pearls and brads from my stash. This box could be filled with some treats or some fun insta-gram photos. Thanks for visiting My Craft Spot! Challenge #152 - Blast from the past! Usually we ask you to make a new project for each challenge, but this time we are breaking the rules! We want you to pick a favorite project you have created some time in the past using My Craft Spot products. Then, be sure to make a new post on your blog explaining the challenge and then link it up. 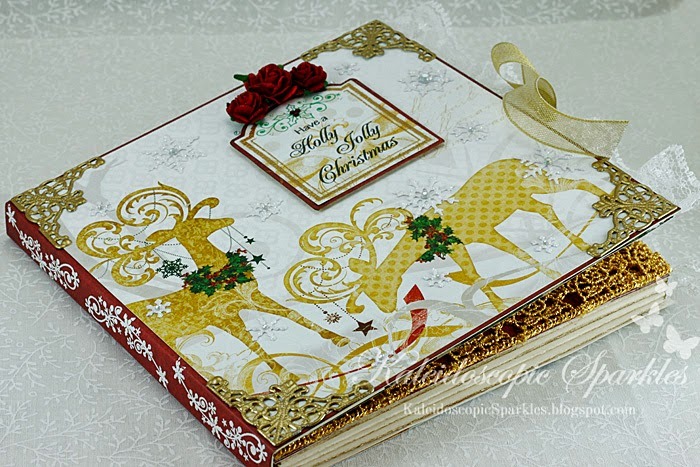 I remember this stunning card that Karen created! It is one of my favorites - so elegant! The inside of Karen's card is absolutely amazing! 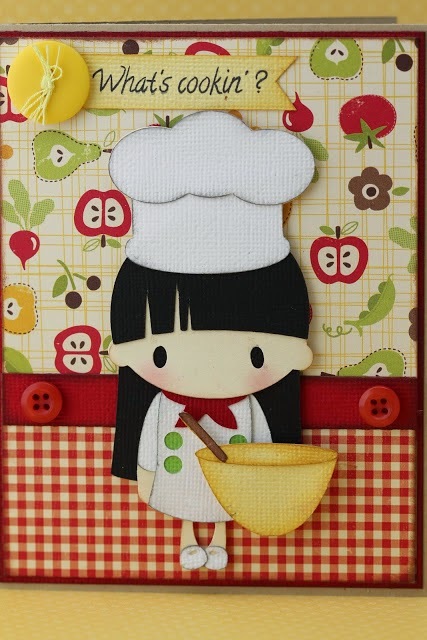 Gwen's sweet chef is just darling! I love her hair and fun hat! The pattern papers Gwen picked are so pretty together! Just perfect with this sentiment! This is such a beautiful card! I love the doily Kate added and her pretty bow! The embossing looks perfect! All so pretty with this sentiment! DT Post by Karen - Bear Hugs! Happy Saturday, crafty friends! 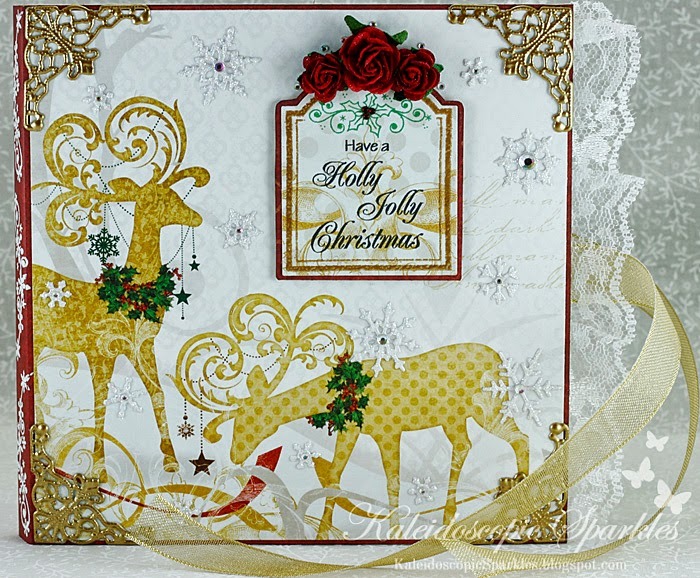 This is Karen from Kaleidoscopic Sparkles with a sweet little card to share with you! The precious sentiment is from Tiny Tags 3, which is cut out with the coordinating Tiny Tags metal dies. I love the bear(y) greetings on that set! :o) I tucked it beneath Buttercup crinkle ribbon, chosen to reflect ruffles of sunshiny love. 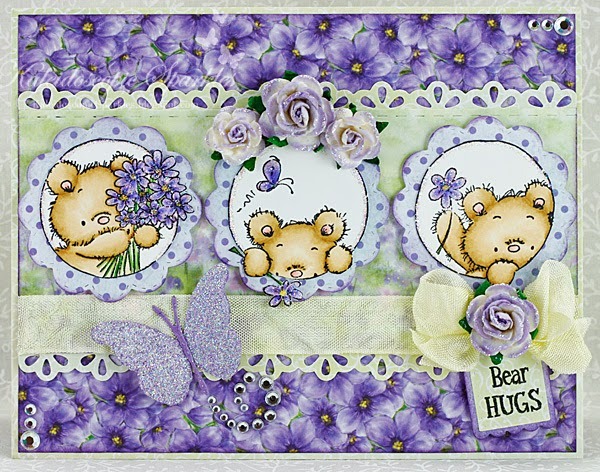 The scalloped bases for the teddy bear stamps are from the Tiny Doilies 2 metal die set. I used the new Fancy Edges- Halloween metal die set to add the stitched design to the top of the middle panel. 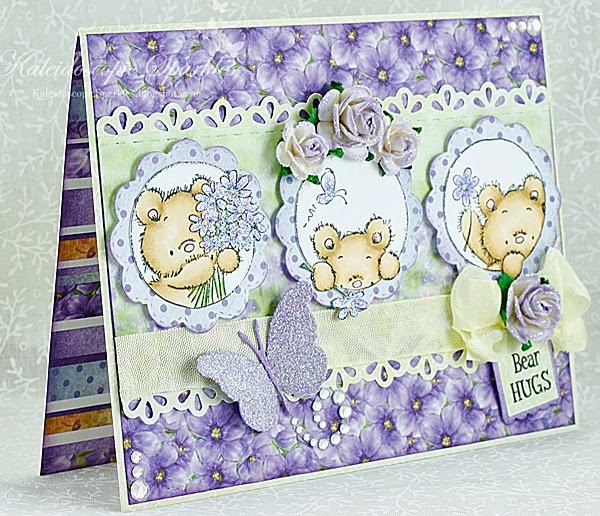 The beautiful borders were made with the floral die in the Fancy Edges 2 set. 10% off Halloween & Fall! I will not be re-stocking these stamp sets until next year, so shop early for the best selection! 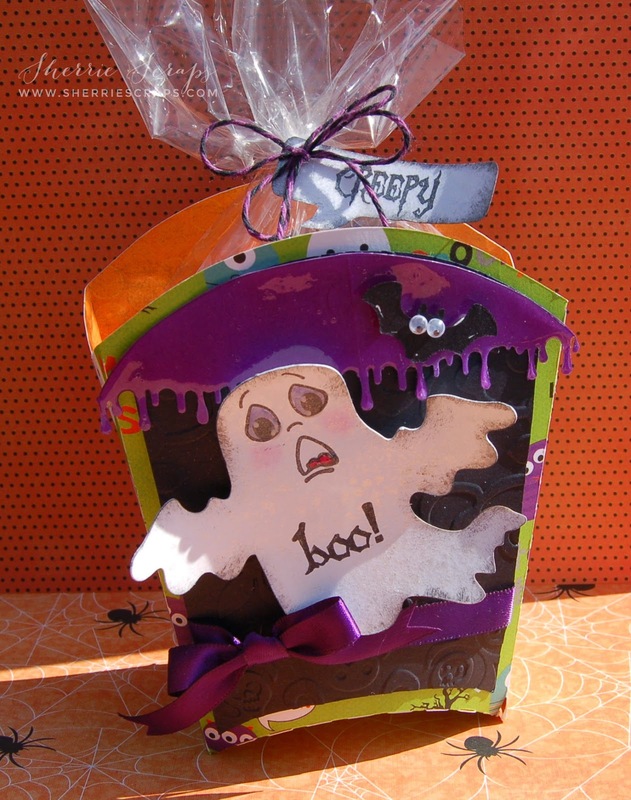 Guest Designer - Sherrie - Drippy goo treat box! This is Sherrie from Sherrie Scraps with Passion and I am super excited to be Guest Designing today here at My Craft Spot! If you follow my blog, you know I am a HUGE fan of My Craft Spot! I have always loved how easy it is to create with her stamps and dies! 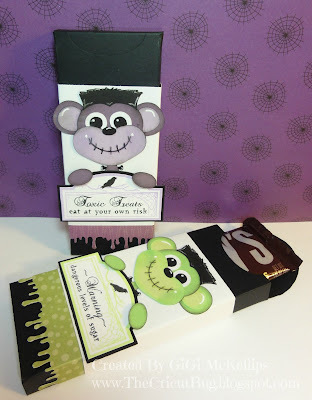 I found this fun 3D Ghost treat box at the Silhouette Store~Design #64969 and cut it on my Cameo. 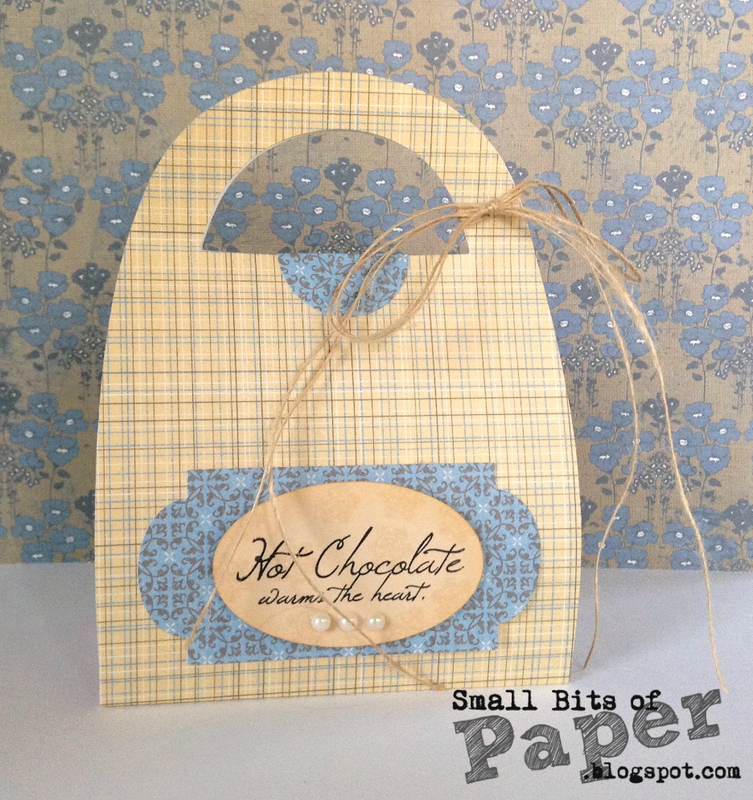 The pattern papers are from Bo Bunny and the solid colored papers are from my scrap bin. The black panel was embossed with the skeleton scroll folder and adhered in place. I added a drippy gooey border and then added glossy accents for a fun look. The cute ghost was inked around the edges with black memento and then spritzed with perfect pearl mist by Ranger. The face is stamped with PK-691 Make a Monster Face set. I colored the eyes in using copics and added glossy accents. 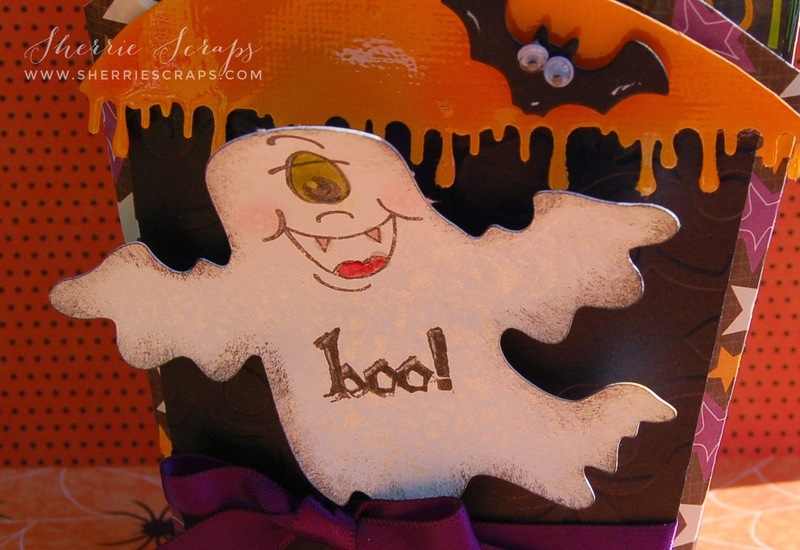 I stamped "boo" using My Craft Spot's new Batty For You stamp set. 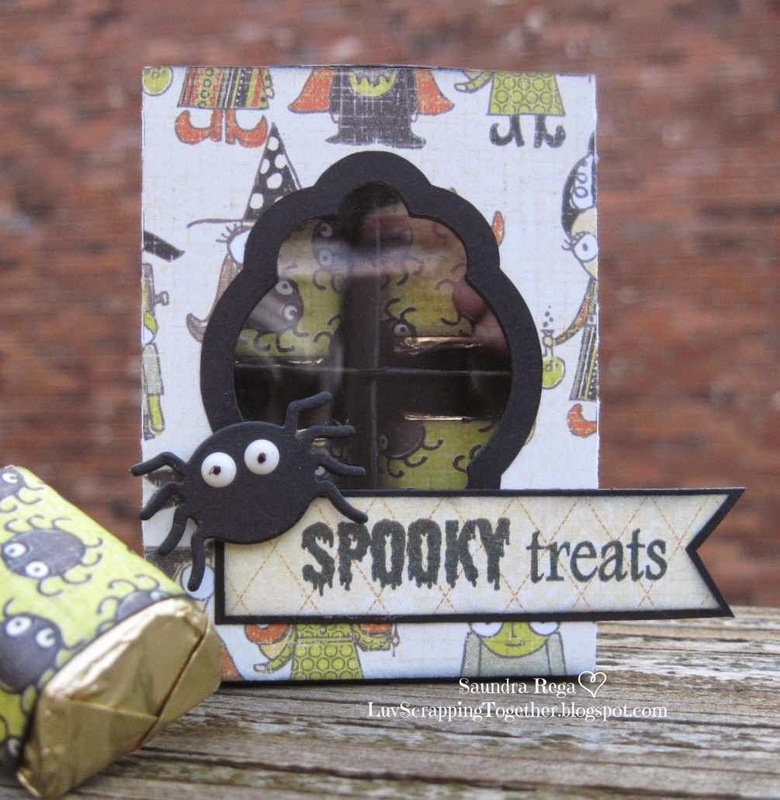 The little bats are from the new Halloween Shapes metal die set. I filled a cello bag with yummy Halloween candy. 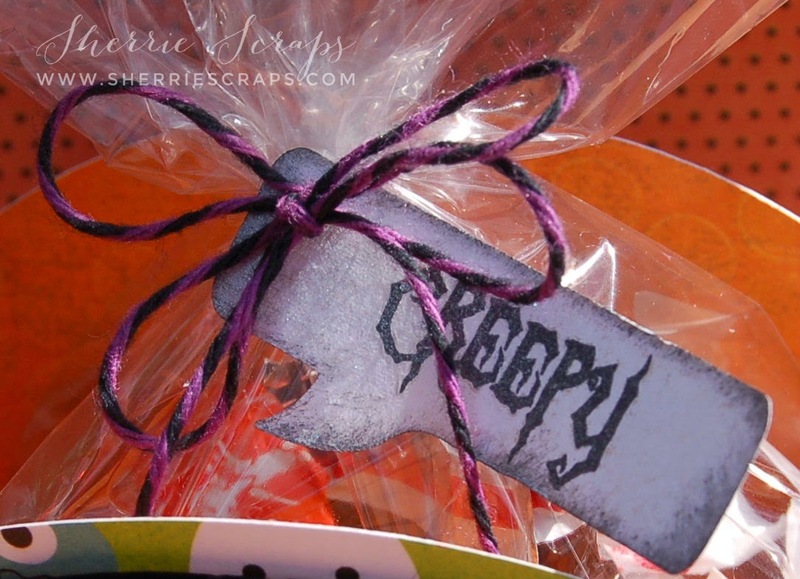 I tied on a bow using Trendy Twine's Halloween Grape Licorice and Orange Licorice twine along with a small tag. The tag is My Craft Spot's Speech Bubbles metal die and I stamped the sentiments using again the new Batty For You stamp set. Thanks so much for having me Kimberly! DT Post by Kate - Hot chocolate warms the heart! Hello friends! This is Kate from Small Bits of Paper. Today I am sharing a fun little gift idea. Here in Central Ontario (Canada), the temperatures are certainly getting cooler and leaves are beginning to turn their glorious array of colours. Hot chocolate season is on its way!! I started my project with the K-Cup cutting file from Pretty Paper, Pretty Ribbons and then added a layered frame for my sentiment. I chose to use the White Christmas stamp set for my treat box - both for the sentiment and for the snowflakes stamped with Versa Mark on my sentiment frame. Once my box was assembled, I embellished it with some natural jute string and some little pearls. Of course, I couldn't forget the hot chocolate itself for the inside, and tucked in a couple of cups of mint hot chocolate. Yum! Thanks so much for visiting My Craft Spot today. Have a wonderful day!! I like to take Halloween treats to a few of my friends during October. 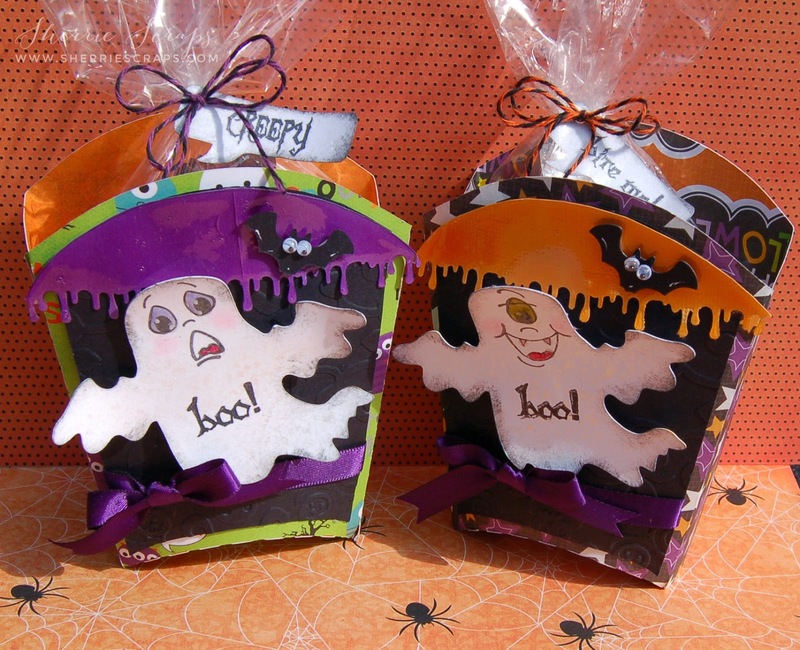 These fun little tags will be perfect attached to treat bags! Don't you just love that spider web border?! For the chalk effect, I first used Versamark watermark ink to stamp the sentiment. Then, I sprinkled a fine white embossing powder over the sentiment and heat embossed. You can see that I didn't get all of the embossing powder off, which is a fun effect. I used a white ink pad that is a little older (less juicy) to ink the edges and then got some white ink on my finger to rub around here and there. Click HERE for our current challenge - Chalk Art! 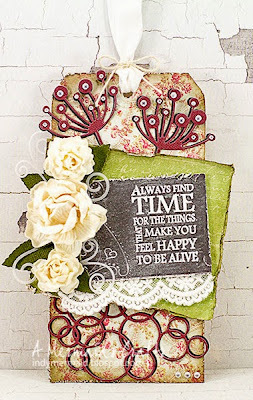 DT Post by Saundra - Fabulous Birthday card! Challenge #151 - Chalk Art! 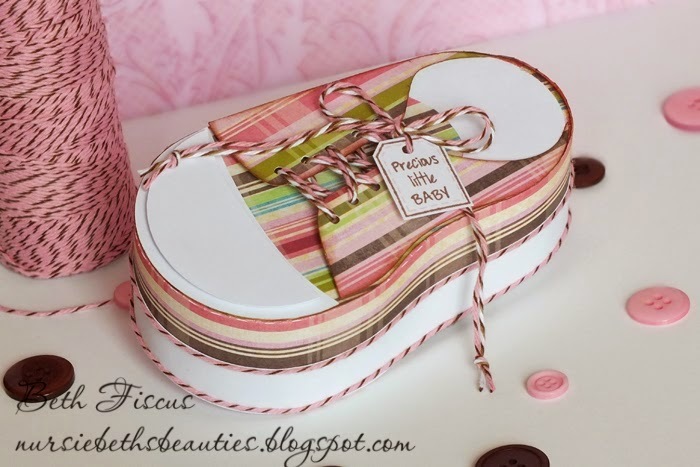 DT Post by Gwen - Batty for you! Guest Designer - Courtney from Courts Crafts! DT Post by Kate - Cute Penguin Shape Card! Winners from Challenge #150 - Back to school! Sneak Peek Day #5 - Batty For You! Sneak Peek Day #1 - Halloween Potions stamp set!